You are here: Home / 2017 / Let’s dive into some reefs. Shall we?? Spending the past two weeks in the Andaman Islands, our group got to experience a side of this trip that we haven’t seen much of, but we have learned a lot about—biodiversity. Up close and first hand we had the chance to see rainforest ecosystems, mangrove ecosystems, and of course marine ecosystems. While we were in the Andaman, we worked with the Andaman Nicobar Environmental Team (ANET for short). While we worked with them, ANET delivered several lectures on the biology of the Andaman Islands and their history. Although most of their lectures had several interesting topics, ANET’s lecture on Coral Reef ecosystems stood out to me the most, primarily because I had the chance to witness elements of the lecture first hand diving in North Bay. Never before had I considered the importance of coral reefs as a species. In the instance of climate change, the need for storm control services has become increasingly important across the globe. Around coastal settlements, reefs actually provide protection from action waves that can cause mainland flooding and damage, and they provide a significant amount of protection too. In the US Virgin Islands, reef protection from wave surge saves the islands about 1.2 million dollars per year. Very similarly in Bermuda, reef protection has saved up to $265 million dollars annually. Reefs like the Great Barrier Reef off the coast of Australia can provide storm surge protection for the mainland. Reefs themselves can provide a barrier for wave protection, but also reefs HOST species that also build sedimentation barriers that shelter coastal regions. One of which, the parrotfish, also provides an important role in maintaining coral health through algal grazing. Corals host such a diverse ecosystem that reef fish account for nearly 10-12% of fish caught in tropical countries, and 20-25% of fish caught in developing countries. As a result, reefs are necessary to ensure fishery vitality. Without reefs, fisherman will lose much of their catch and their source of income. In India, the fishing industry employs 14 million people, and it accounts for nearly 10% of the country’s exports. So much of India’s economic vitality remains dependent on coral reef sustainability. Some of the marine life harvested through coral ecosystems have medicinal benefits as well. For instance, many sponges and sea cucumbers residing on coral have been harvested for cancer research. A variety of coral species have provided medicinal benefits for arthritis, ulcers, heart disease, and even bacterial infections. Fishermen also harvest reef marine species for commercial use in nutritional supplements, enzymes, and cosmetics. Corals create jobs for more than just fisherman. They have developed a thriving industry for tourism, snorkeling, and diving too. In total, coral attractions produce an annual global revenue of nearly $375 billion dollars. It has developed into a primary tourist destination for coastal regions across the world. 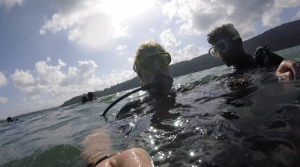 Snorkeling provides a popular tourist activity that produces lots of revenue for coastal areas. Humans benefit from corals extensively, but too often these benefits have been overlooked. Human-coral relationships have failed to provide a sustainable context for reef vitality to continue for much longer. As a result, reefs in India and across the globe currently have experienced significant amounts of damage. Until recently, paleontological studies in Belize, the equatorial east pacific, and Indonesia have shown that the world’s coral has actively and continuously grown. Within the last 20 years, that growth has stunted. Since 1998, the world has recorded three of its first known global bleaching events (1998, 2010, 2015). Scientists speculate most of these bleaching events started in the Pacific Ocean as a result of global increases in ocean water temperature related to the “El Niño” phenomenon. Specifically, in India, scientists have performed limited research on coral vitality. But since baseline studies started in 2000, we do know that coral ecosystems in India have seen a sharp decline in health over the last 15 years, and corals in India remain susceptible to global effects of climate change too. As compared to the rest of India, the Andaman and Nicobar Islands remain the richest and healthiest collection of coral reef habitats that India has to offer. Wandoor’s Mahatma Gandhi national park on South Andaman Island houses the largest coral reef conservation park in the entire country, and the islands themselves have the largest coral species diversity found in the country. In terms of damage, many of the islands reefs have been spared as compared to the reefs closer to the mainland. Yet the 2004 Tsunami significantly reduced coral cover on both the Andaman and Nicobar reefs, and the south islands have experienced some damage from siltation and eutrophication through terrestrial runoff, discharge, and logging. Nonetheless, reefs in the Andamans still remain at risk for future damage in the wake of lacking eco-tourism, climate change, and a higher demand for fishing that will increase with India’s population growth. Consequently, we need to understand why coral reefs experience stress, and we need to know how we as humans have caused stress to their vitality as ecosystems. How do corals get damaged? – The reason and science behind their stress and damage. Since coral reefs survive on an endo-symbiotic relationship with photosynthesizing algae, the vitality of one organism will dictate the survival of the other. Coral reefs grow in specific abiotic conditions in order to harbor their endo-symbiosis with zooxanthellae photo-synthesizers. Therefore, corals require habitats between 25-31 degrees Celsius, shallow waters with adequate sunlight, clear water to allow sunlight, and even then, not too much sunlight, because overproduction of oxygen through photosystems can even stunt coral growth. In general, because coral have particular environmental circumstances in which they can grow, whenever these environments change, corals experience stress. Stress can come in different forms: change in light availability, change in water temperature, and change in symbiotic algae nutrient levels. In any instance of stress, the response of corals usually remains the same— expulsion of their symbiotic residents. Spitting out their algae, corals cut out their source of food and start to bleach. Once corals bleach one of two things can happen; the coral can overcome its stress and absorb new zooxanthellae, or it will slowly die from starvation. In the instance that stressors continue for long periods of time, corals eventually die and a phase shift occurs in the ecosystem where coral reef ecosystems transition into a new ecosystem for different organisms. Diver observes the reef area that has shown signs of bleaching from stress. To start, increased human greenhouse gas emission has contributed to global climate change which remains the biggest global stressor on coral reef vitality. Higher levels of carbon dioxide in the atmosphere have trapped heat and increased carbonate concentration in oceans. Consequently, Ocean temperatures have risen, and the melting of the polar icecaps have changed the ocean’s salinity levels, and increased their depth. Globally, changes in water temperature, salinity levels, and sunlight penetration affect how much symbiotic algae can produce and provide food for its coral host, while also increased carbonate concentration has started deteriorating reefs too. In India, water temperatures in 100 observed reefs rose 3 Celsius degrees above average within the past year. Regardless of climate change, Overexploitation of reef species in India presents itself everywhere. As a result, a lack of enforcement can cause ecosystem stress and result in trophic cascades. In the context of coral reefs, humans (predators) overexploit herbivorous reef fish that graze on coral algae living on the corals exoskeleton. Overfishing of these reef fish allows for algae to grow on top of corals limitlessly, which covers their exoskeleton and does not allow for zooxanthellae to adequately photosynthesize. Nonetheless, worries about trophic cascade effects on the reef’s ecosystem life have not changed India’s fishing behavior. In fact, the country has subsidized fishing in reef environments such as the Andamans. They have provided more gear, more boats, and better equipment to increase catch size and abundance. As a result, government-provided trawlers increase fishermen bycatch and often they unintentionally haul in species necessary for reef survival. This phenomenon could be stopped if government regulations already put in place had some level of enforcement, but often laws are overlooked. Also, consumers have not changed any demand for fish on the basis of sustainable fishing, so as long as fish continue to be landed, the fish will be bought without any regard to whether or not fishing practices were sustainable. Reef damage also occurs in tourism. In the Andamans, tourism revenue spiked to nearly 18,900,000 rupees in 2006, and since then it has grown immensely. As a result, commercialization of tourist destinations in small bays and islands like Ross Island, Havelock Island, and North Bay provides day ferries so that travelers can have the chance to see reef ecosystems with their own eyes. Experiencing coral reefs first hand plays an important role in educating the general public on coral reef significance, but mal-practice of reef conservation in the wake of tourism, and too much focus on commercialization can compromise the health of the reefs. Reefs can be trampled by boats, and divers can destroy reef structures by trampling and touching reef habitats. Understanding the ways in which corals experience stress and destruction, we can provide methods and practices in order to help coral reef restoration. Many techniques can be used, and some are easier than others. In the past, many of the problems surrounding understanding the deterioration of coral reefs has come from the lack of information on historical reef health. Today, baseline assessments from 1998 onwards are available for reefs across the world and all reefs in the Indian Ocean. All assessments have taken note of significant markers in coral reef health, such as the extent and impact of the 1998 bleaching episode, the disease and stress induced mortality present in Indian reefs, and the quantification of reef area loss due to past earthquakes and tsunamis. Providing baseline information on each reef gives scientists a method of comparison to judge the projection of coral reef health into the future. In the effort to revitalize coral health during stress events and over-exploitation, many onsite techniques can provide protection so reefs can grow in undisturbed settings. Establishing protected areas and no-take zones stand out as some of the easiest ways to provide in-situ conservation. Harder ex-situ techniques include re-establishing dying reefs by rearing coral larvae and transplanting them to off-site locations. Although, ex-situ techniques provide obstacles because they require lots of money and hired and trained professionals, and also coral reefs take years to re-develop. Sustainable fishing provides one of the easiest and most efficient ways of contributing to coral reef restoration. Currently, established laws regulating prohibition on fishing gear, established closed and open seasons, and planned demarcation zones have already been written. Although, the government has not adequately enforced these regulations, and much of the legal interpretation has been left open to the villages surrounding the fisheries. Providing a method to enforce laws with on-site game wardens who provide fines or incentives for sustainable practices would mean a first step in the right direction. Currently, organizations such as the Marine Stewardship Council (MSC) have taken the initiative to establish a basis for sustainable fishing, and provide incentives and certifications for those that adopt such a practice. They define sustainable fishing as “ensuring sustainable fish stocks, minimizing environmental impact, and maintaining productivity and biodiversity of aquatic ecosystems”. They have had a few success stories too. In the Ashtamudi Estruary off the coast of Kerala, the MSC awarded its first blue label certification award to a clam fishery who had implemented several sustainable practices into their fishing regimen. With the help of the MSC, they set a banned fishing season from December to February allowing clams breed, and they also imposed requirements for mesh and export sizes. By employing these guidelines, the clam fishery quickly saw previously deteriorating stocks of clams start rising. MSC’s guidelines also allowed for fisherman to maintain a steady income of 1500 rupees a day. Similarly, the MSC has pursued efforts of establishing sustainable fishing in the Sindhurg Community on the coast of Kerala by distributing square nets to all trawlers and setting catch limits, but much of this project has yet to make substantial leaps forward. Eco-tourism also allows for an easy way to ensure coral reef restoration and conservation in the long run. Eco-tourism can be defined as “the use of the natural environment for tourism and recreational purpose without harming or disturbing ecological balance”. In order to avoid “harming or disturbing ecological balance,” two measures need to be made. First, commercial tourism needs to develop a better respect for the ecosystem and worry less about money. Docking in North Bay, I noticed the commercialization. The goal of most vendors and diving agencies was to produce as many clients as possible in the 6-8 hours they had to produce business. As a result, they hoarded people in and out of the water in crowds, trampling over corals, touching corals, and scaring fish in and away from reefs. I didn’t see any organized management to control the environmental impact of trash pollution, gas leakage from boats, or even increased siltation in the water. Secondly, commercial tourism needs to focus more on education. While scuba diving in North Bay, I got to see tons of reef fish, anemones, and a variety of coral structures, but I never understood their significance. The island didn’t provide any visible information centers, exhibits, or host any talks to educate the public on the importance of coral vitality and the ecosystem services it provides. If commercial tourism took the initiative to provide some education, they could probably improve more than coral reef restoration efforts. They could probably improve their business for the long run as well. Ross Island and North Bay are two locations in the Andamans that could provide extensive reef education outlets. Looking forward, coral reef restoration could prove to be cost effective. Eventually, people will have to make adaptive measures to conserve coastal regions in the light of climate change, and changing small behaviors in order to preserve natural habitats and their ecosystem services can provide more of an investment than creating artificial shelters through human infrastructure. In eight different Caribbean islands, reef protection has proven extremely cost-effective because it has preserved many jobs built around coral reef ecosystems, and it has avoided sinking money into a pit for infrastructural development. In total, coral reefs can fly very low under the radar in terms of public education and concern. Often we don’t understand how much of our lives rely on marine ecosystems beneath the surface of the water. And as a result, we compromise the gifts of biodiversity that marine ecosystems provide to us. In all, corals have EXTREME value to human life, and that value needs to be considered. Mahima Jaini, Andaman Coral Reef Ecosystems, ANET, 2017. Dr. Christopher Paradise, Coral Reef Ecosystems, Port Blair, 2017. Dr. Venkataraman, Geographic Ecology of India, MCC Chennai, 2017. Dr. Jayaraman, Transformation of the Land and Coast, MIDS Chennai, 2017.